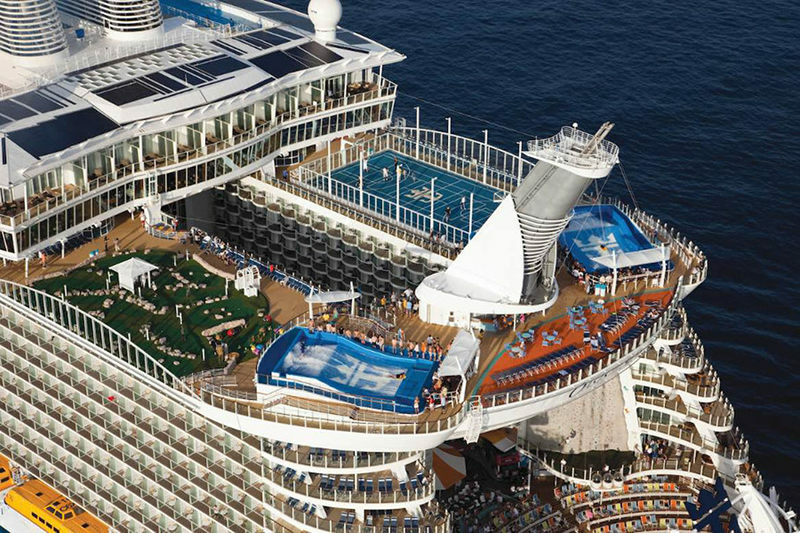 Every year, cruise ships get bigger and bigger. 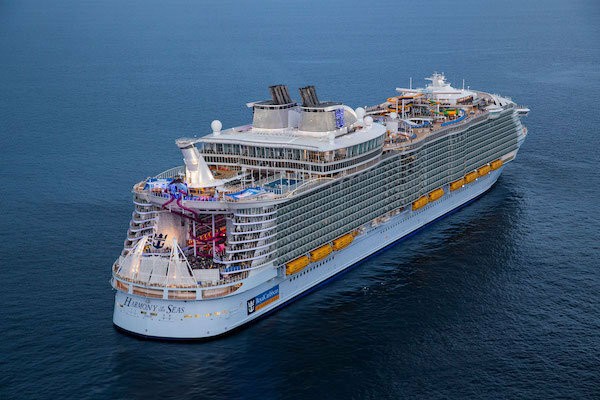 If you’re like us, you like to sail the largest cruise ships possible. 2019 is the year of the massive vessels. 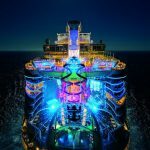 If you’re starting to plan your 2019 cruise vacations, we hope that this helps to find the massive vessel you’re looking for. 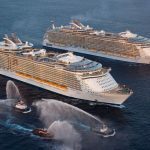 Despite the post title indicating five ships, we’re actually listing out the Top Six Largest Cruise Ships in the world. Why? Well, because there’s a tie for biggest ship mixed in there among the ranks. 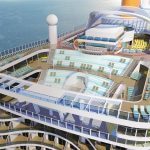 Ships are built in “classes” and often times the cruise lines will re-use plans. When they find something that works well, they’ll stamp out (gross understatement) a few more of the same footprint. Evidently, people liked the the big ships, because the average ship size keeps getting larger and larger. 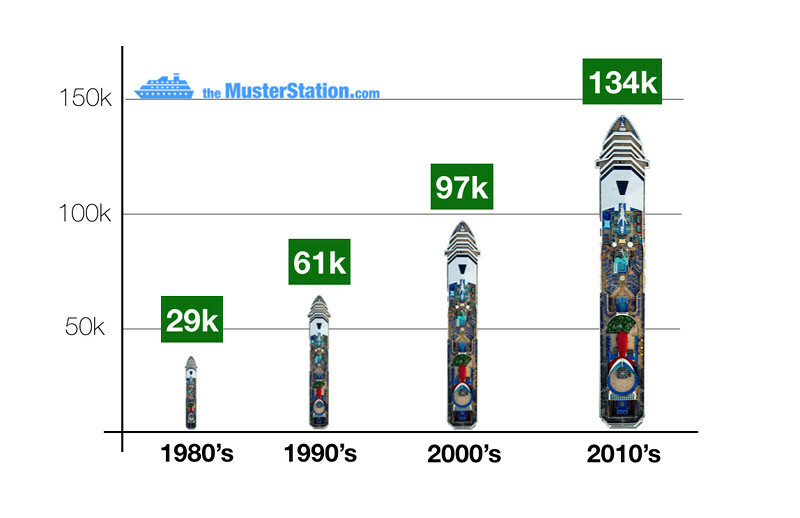 As you can see from the chart below, the average ship size in this latest decade is 134,000 gross tons. 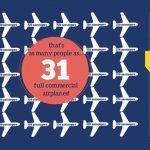 This is over 4x the size of the average cruise ship in the 80’s! 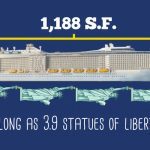 If this pace continues, the largest cruise ship in the world in 2050 will be the size of Delaware. But, back to today. 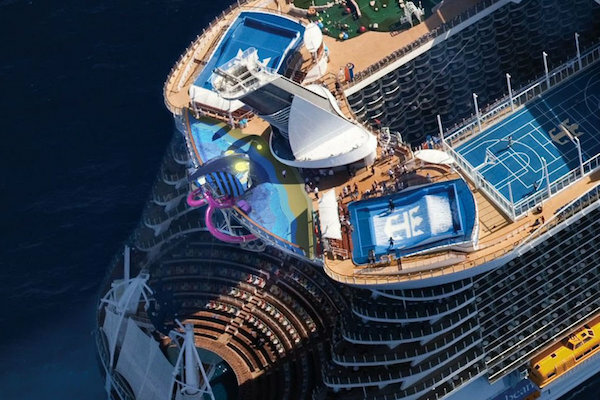 Below you’ll find the largest cruise ships in the world by end of 2019. 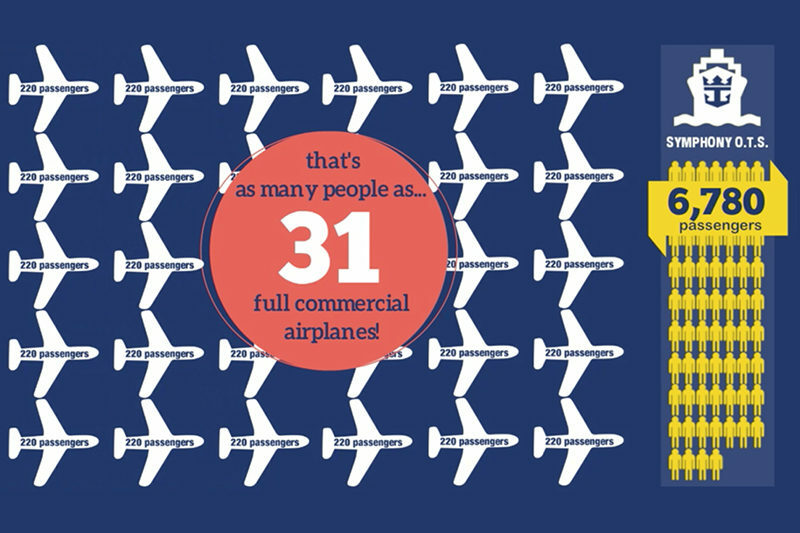 Check out this quick video highlighting the world’s largest cruise ships. 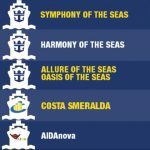 Here’s the list below with some additional facts on each vessel. 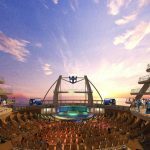 The Symphony of the Seas took the title for largest ship from its sister (how rude, right) the Harmony of the Seas, built two years earlier. It clocks in at roughly 1,000 tons larger. 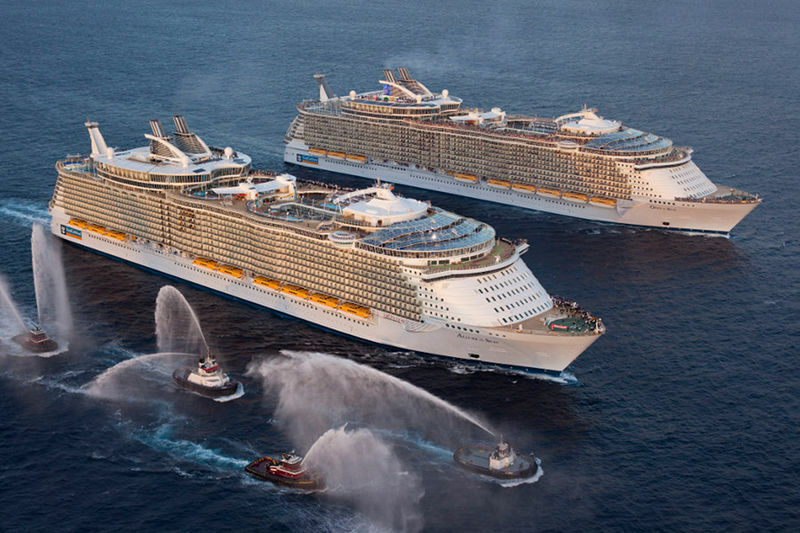 While this is the equivalent of 500 normal automobiles, it represents about 0.05% of the ship’s total weight. 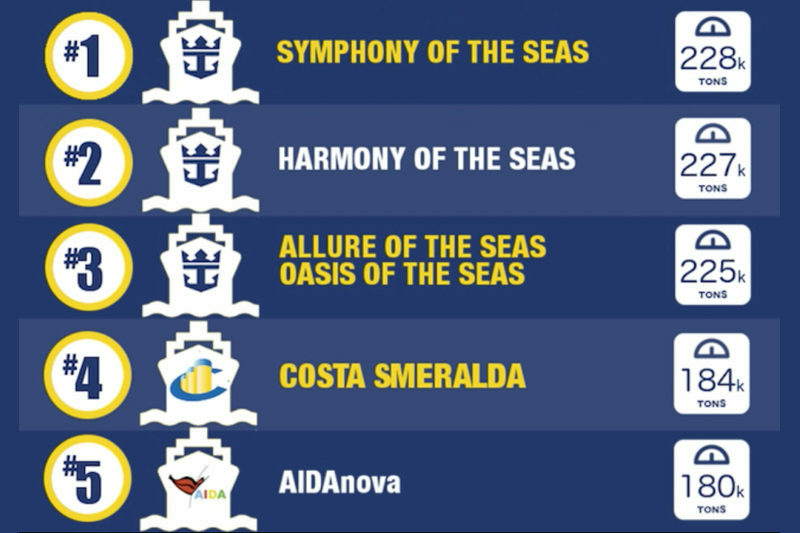 The ship is so huge, it has seven different “neighborhoods!” They include the following. 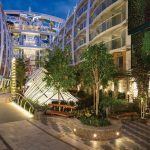 While these neighborhoods aren’t new to Royal Caribbean, there are a few fresh additions to the Symphony. 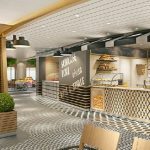 These include the new Playmakers sports bar, larger zipline, 1,000 SF “Ultimate Family Suite,” and Hooked Seafood Restaurant. 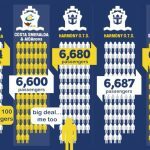 Here are the stats for the World’s largest cruise ship, the Symphony of the Seas. 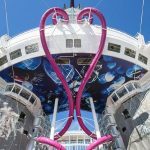 The Symphony of the Seas has more pieces of art on board than found in the Louvre Museum in Paris! On an average 7-night sailing, over 60,000 fresh eggs are used on board! 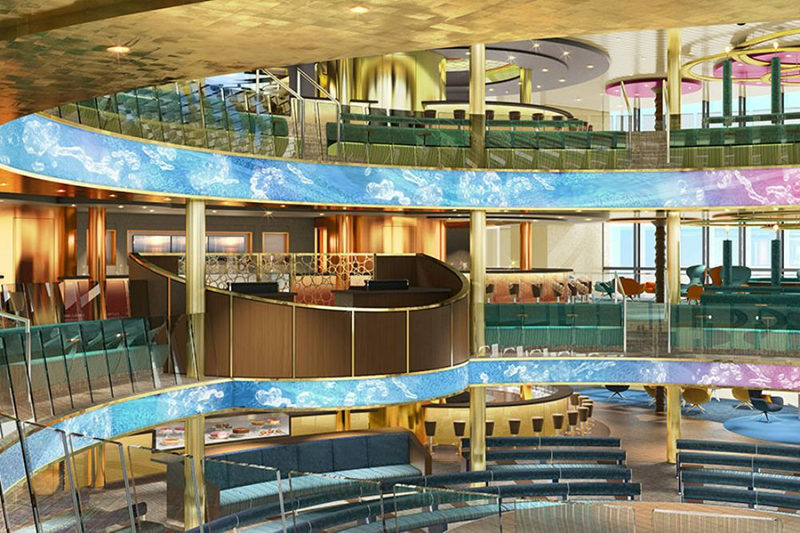 On a week-long cruise, six million coffee beans are required to make the total coffee made on the ship! 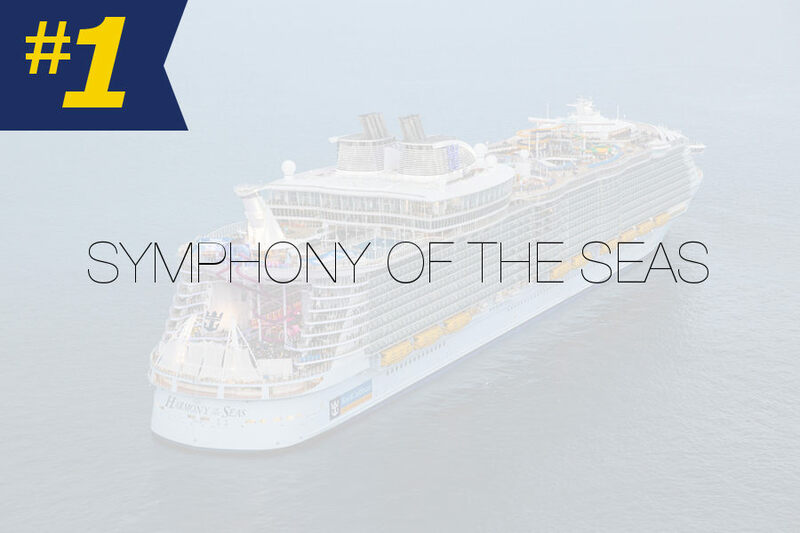 During a 24-hour period on the ship, roughly 500,000 gallons of fresh water are consumed. Compared to one eruption of Old Faithful, the Symphony’s 24 pools and water attractions use close to 100x that amount of water. 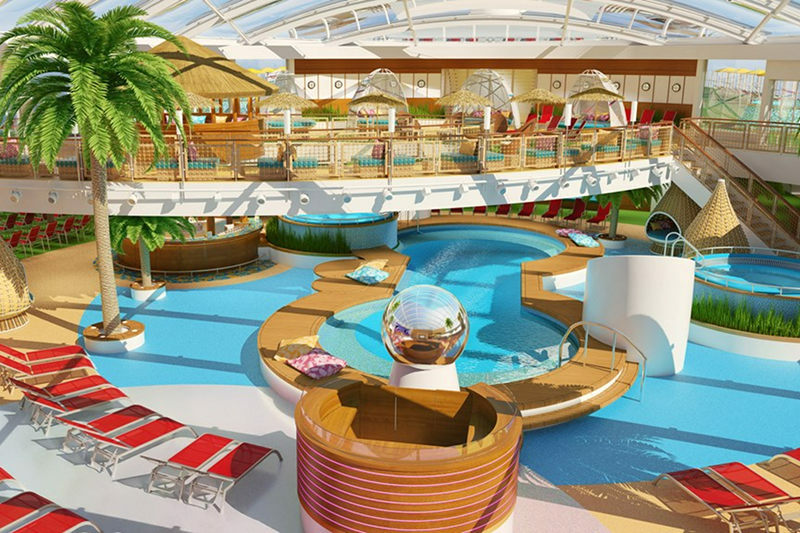 Like it’s sister ship, the Oasis-class vessel hosts four swimming pools and 10 hot tubs. 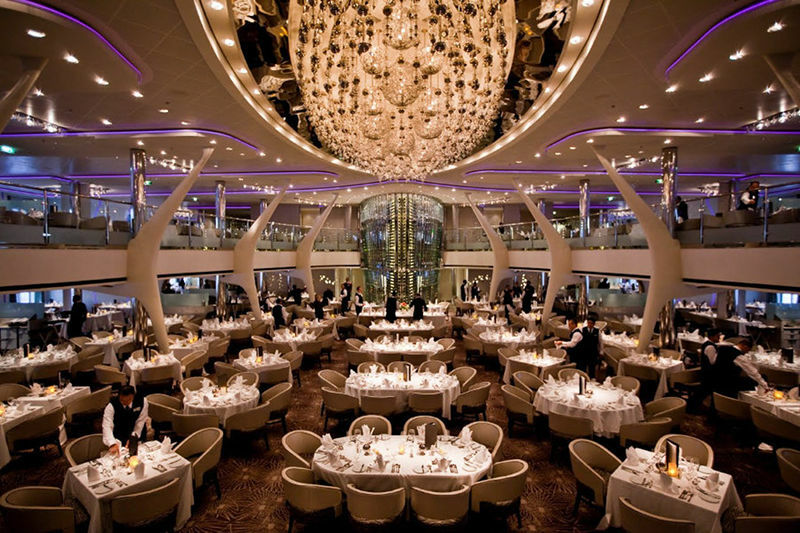 You’ll find 20 dining venues and over 11k pieces of art! 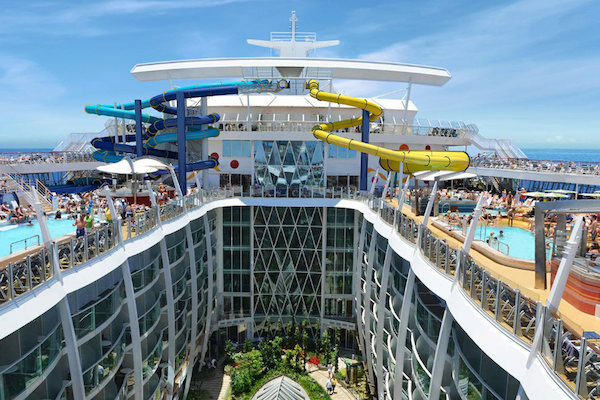 Guests love the “Perfect Storm” water slides and also the 10-story, dry slide called the Abyss. 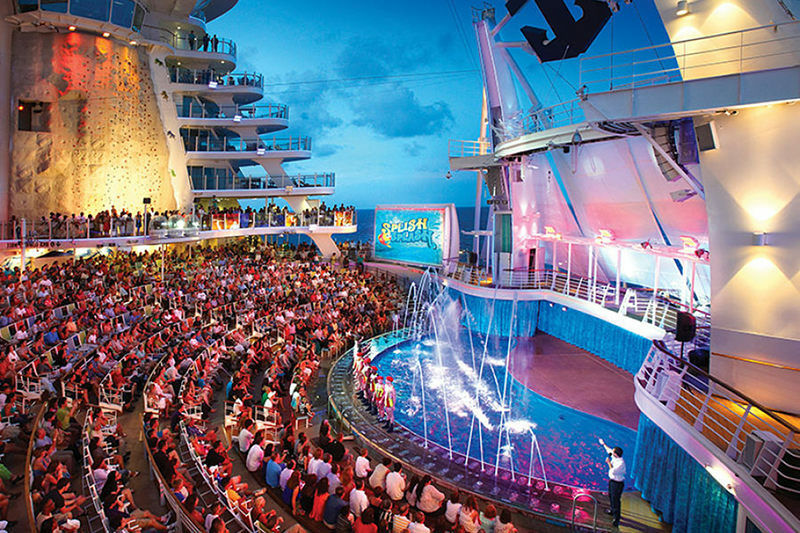 There’s an Ice Rink, Aqua Theater, and Broadway-style Theater. 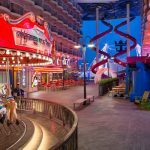 Sporting enthusiasts have the options of basketball, ping pong, rock climbing, or surfing on the Flowrider. Shopping fans can’t get enough in the ship’s promenade mall. 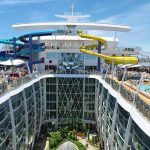 It’s the World’s 2nd largest cruise ship and Royal Caribbean makes great use of every inch! 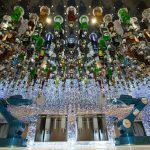 The Harmony of the Seas carries more than 340 wine varieties and 40 brands of beer. 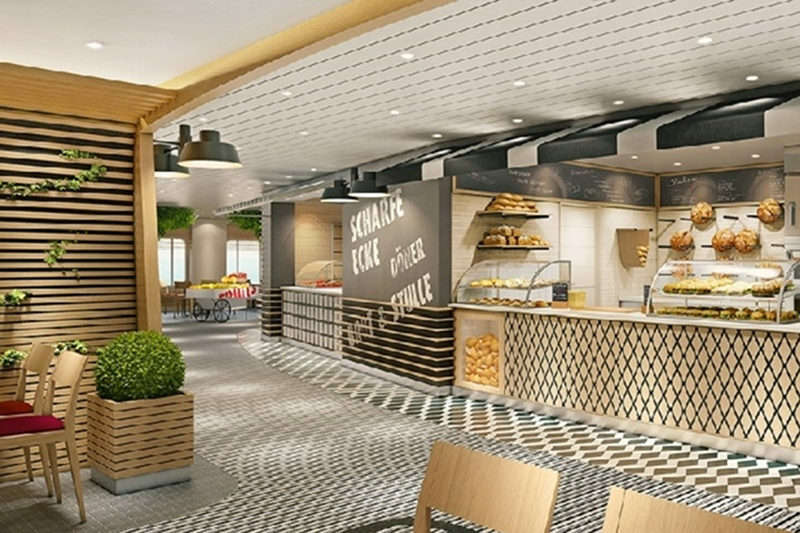 The Harmony of the Seas offers passengers over 100 different kinds of pastries. 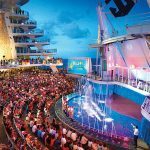 The Aqua Theatre on the ship has a deeper swimming pool than any other located on a cruise ship. It can be adjusted to a depth of 18 feet. 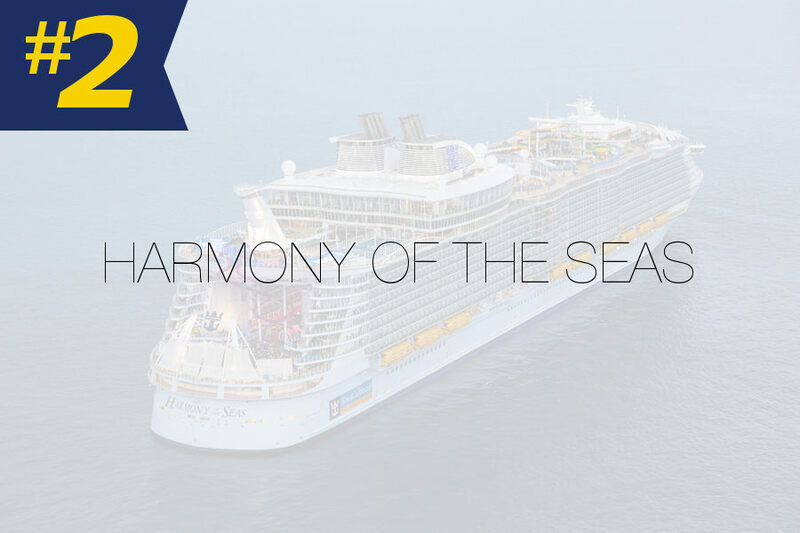 To facilitate its speedy internet, the Harmony has a dedicated satellite. 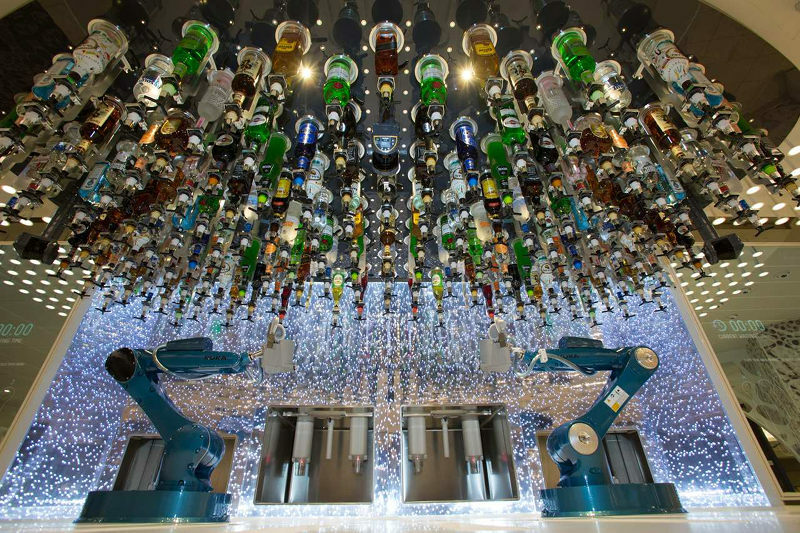 On board, you’ll find 184 “mixologists” and bartenders to make sure you’re quenched… oh wait, 185 if you include the bionic bartender. 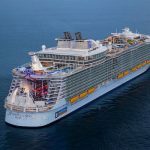 While both ships were built to the exact same specifications, technically the Allure of the Seas is 2.0 inches longer than the Oasis of the Seas. 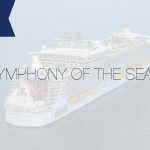 But, we’re including both as our Second Biggest Cruise Ship in 2019. 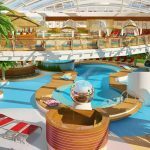 The Oasis was the first of the “Oasis Class” ships built in 2009 and truly broke the mold for huge vessels. 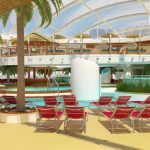 Before the Oasis, nothing close to that size had been seen in passenger vessels. Innovations never before seen were introduced with this class. 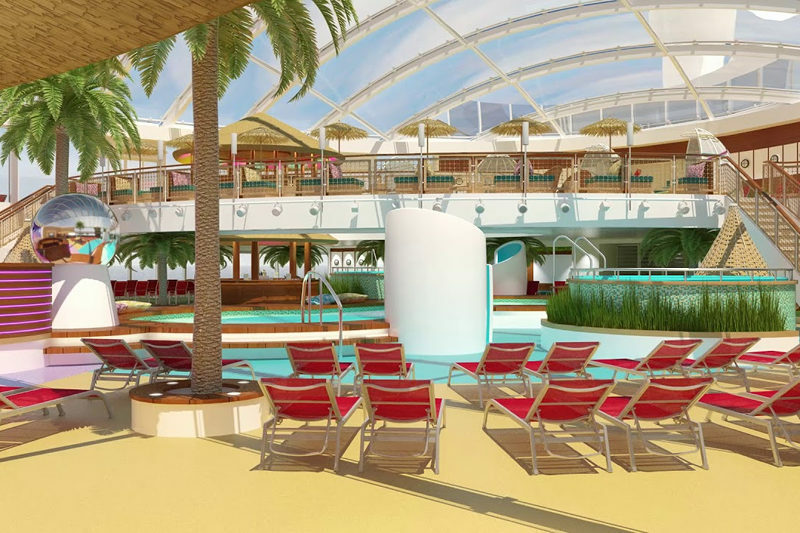 Included was the “Rising Tide” bar, which spans three decks and the “Flowrider” surfing simulator. 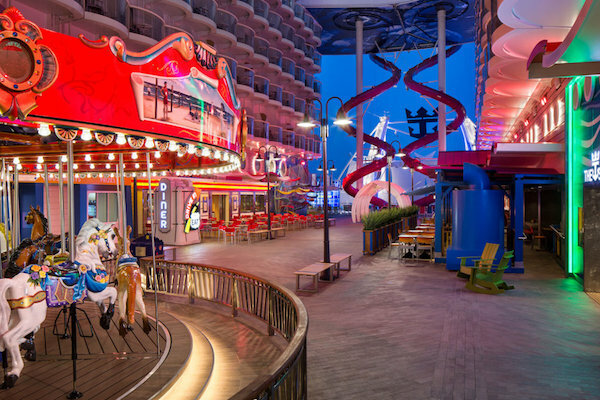 The ship offers unique neighborhoods that vary drastically, like Central Park, the Boardwalk, and the Royal Promenade. 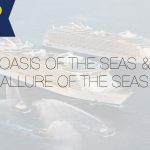 The Allure was added to the Oasis class the following year in December 2010. 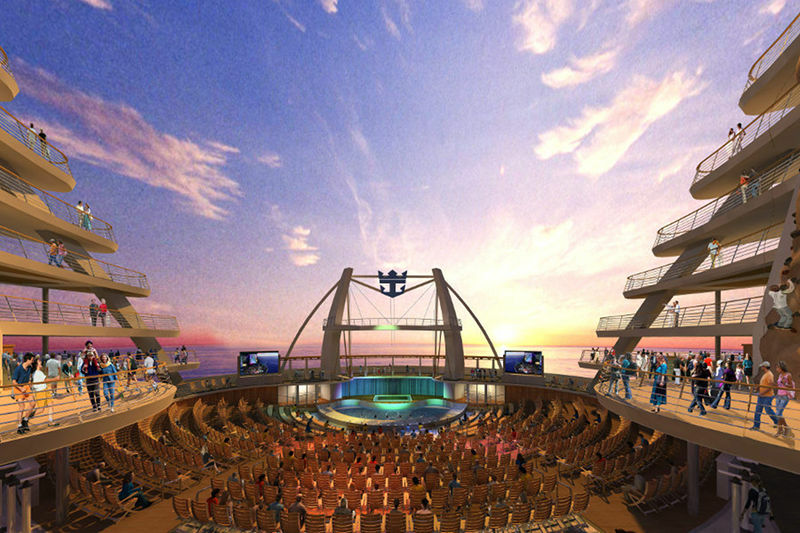 These ships raised the bar (figuratively and literally) for cruise ship innovation. 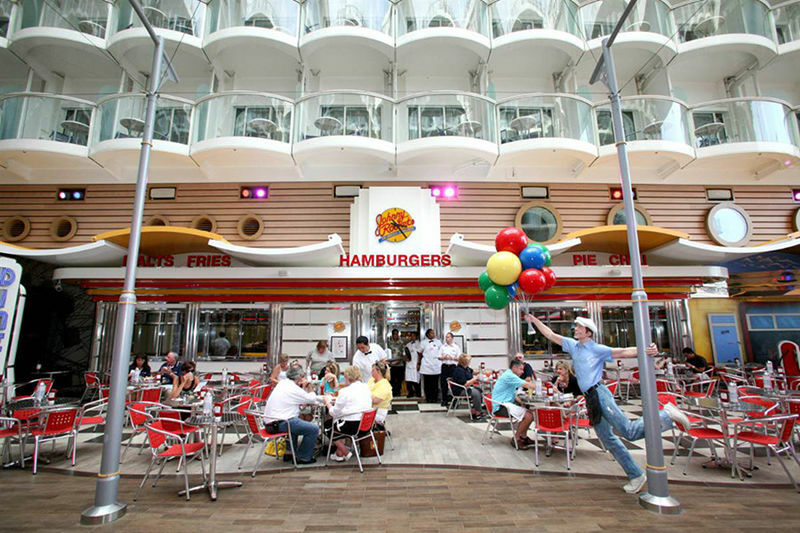 8,000 gallons of ice cream are consumed (serious brain freeze) each week on these ships. 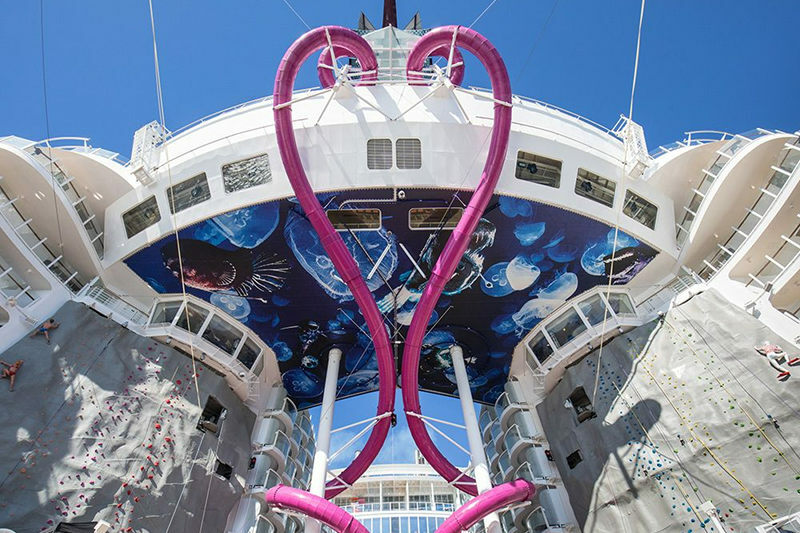 To power the Oasis Class ships, these vessels have over 3,000 miles of electrical wires. That would almost stretch the entire width of the United States! The bread you’ll eat at dinner is freshly made. There’s a machine in the kitchen area that bakes 4,000 rolls ever hour. 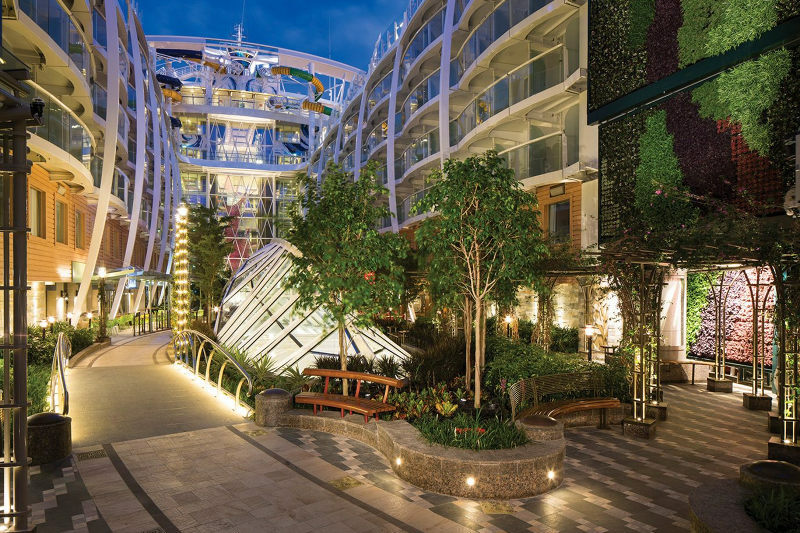 Wall walking through Central Park on each ship, you’ll be surrounded by over 12,000 plants. 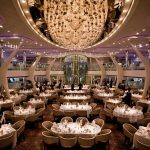 During a weekly cruise, 60,000 napkins are used. The Costa Smeralda doesn’t have the most enticing name, but when you’re this big you can do whatever you’d like we suppose. In junior high school, there was a six-foot boy with a hint of a mustache named Francis and you best believe nobody made fun of him for it. 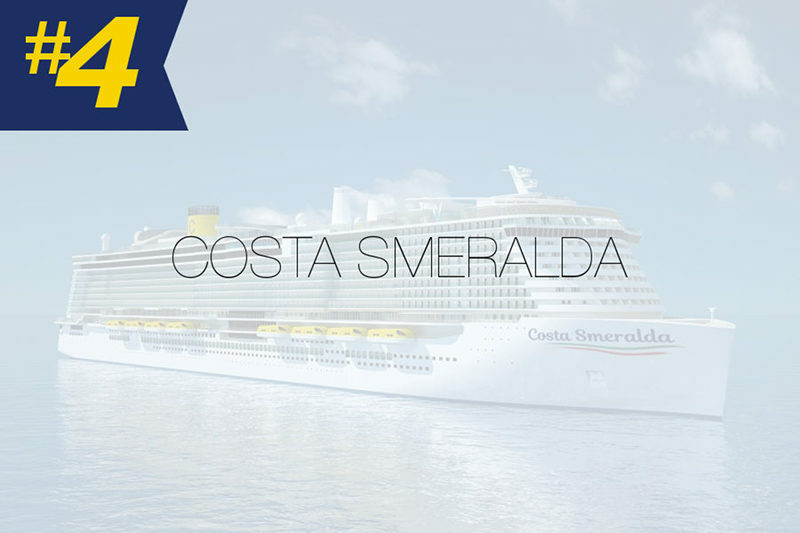 Costa is not known for its large ships so the Smeralda really puts them in the big leagues. 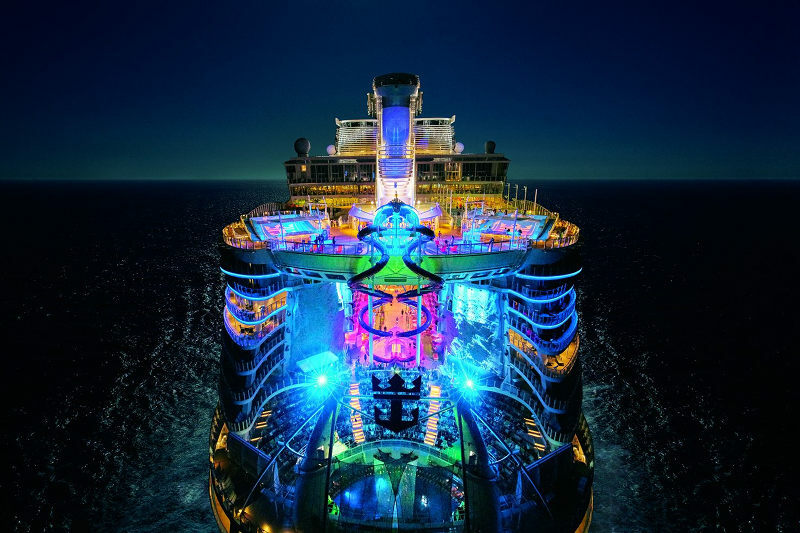 And, when compared to the other massive vessels it has one special attribute that sets it apart from the others. 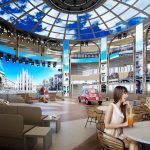 Costa designed it to be powered on an LNG combustion system that makes it “the cleanest in the world.” Although, this feature won’t be entirely unique as you’ll see in our #4 largest cruise ship in the World. 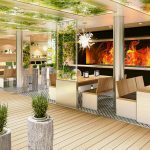 The Cost Smeralda debuts in November 2019 and will offer itineraries within the Mediterranean shortly after. AIDA is another dark horse coming through with a huge ship out of the blue. 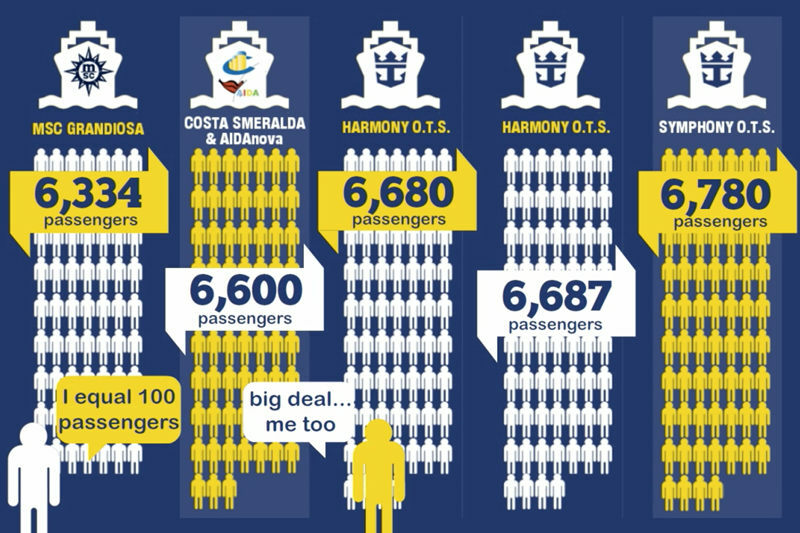 Among their 10 other ships, the average size measures roughly 50,000 gross tons. 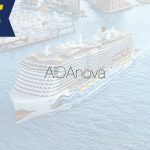 The AIDAnova is over 3x their normal vessel weight size weighing in at 180,000 gross tons. Let’s hope the company knows how to handle all of that ship! 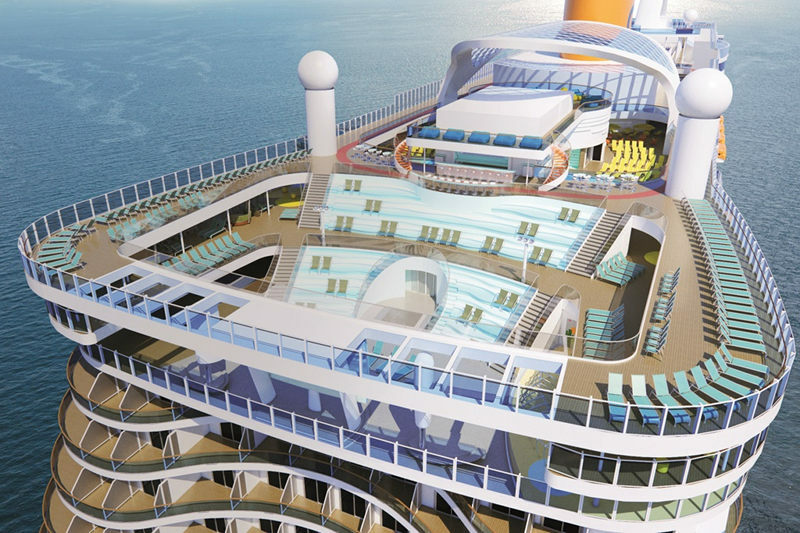 We’ll find out whether this is the case when the ship launches in December 2018. 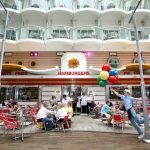 She’ll be serving up itineraries in the Canary Islands. 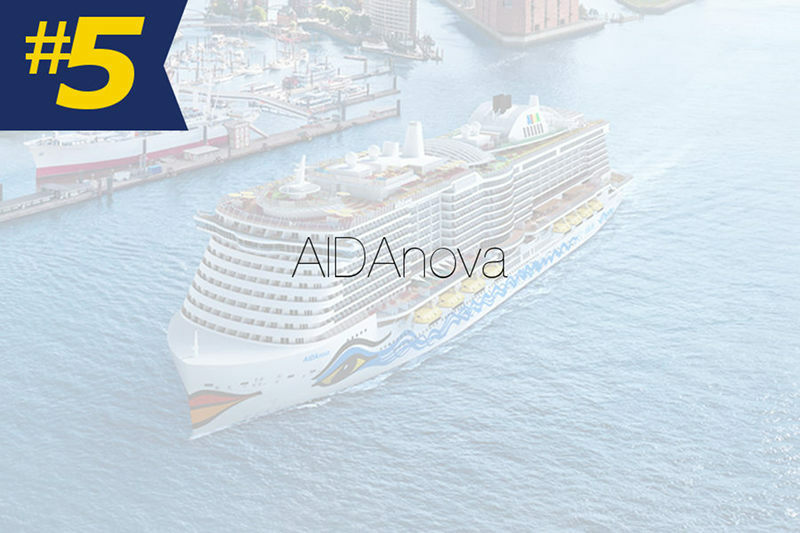 The AIDAnova will be a favorite of our environmentally conscious cruisers, as the ship is powered solely by liquified natural gas (LNG). 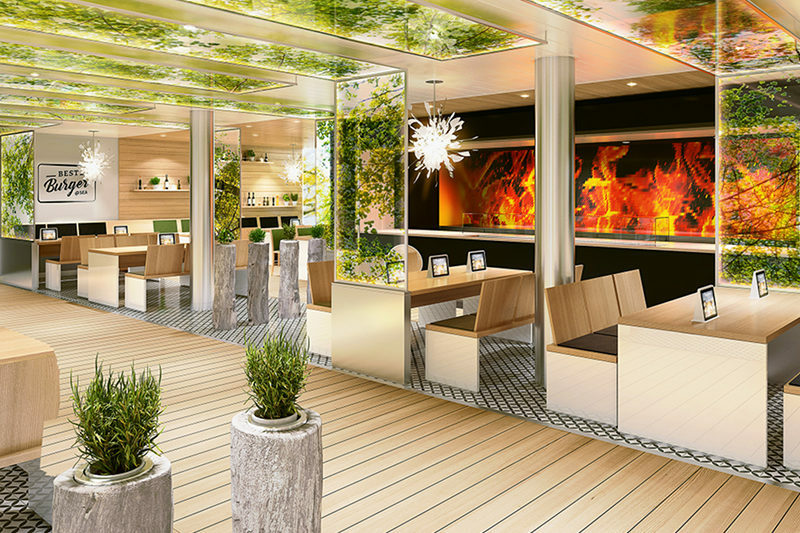 It’s the very first ship to feature this eco-friendly fuel source. If you’re not satisfied with just five, we have you covered. 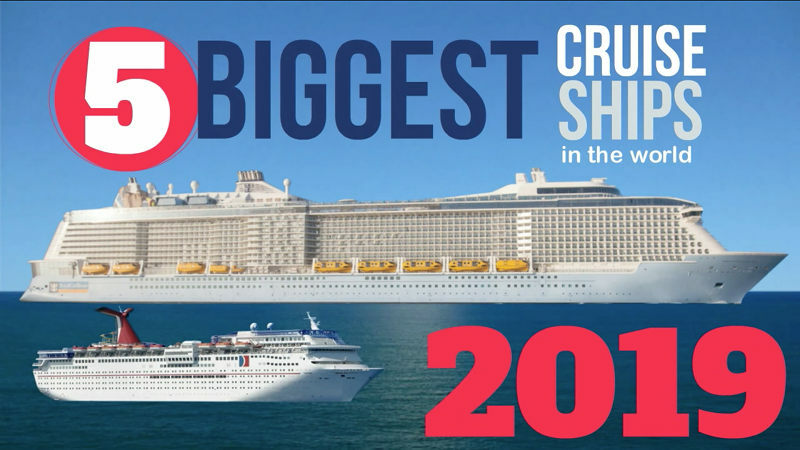 Below, you’ll find the top 20 largest cruise ships in the world based on gross tonnage! 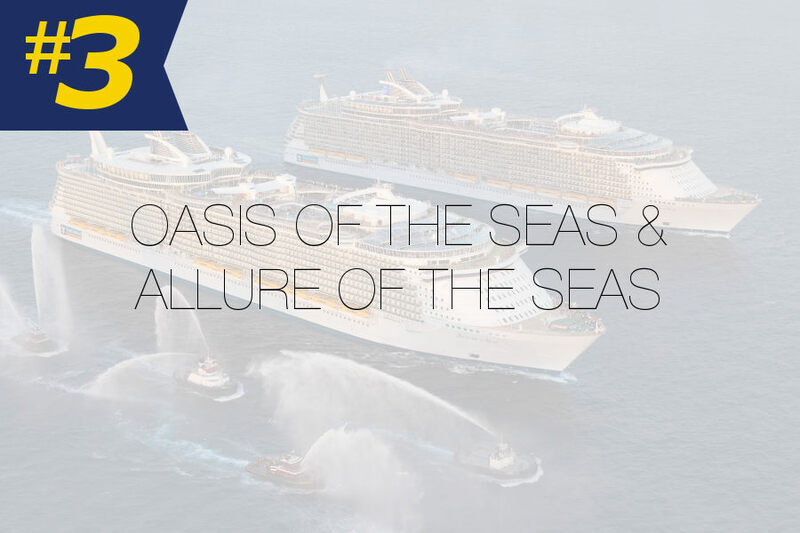 In the slides below, you’ll find ship to ship comparisons for capacity and tonnage. 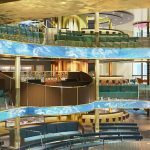 You’ll also get a couple extra nuggets on the Symphony of the Seas, the world’s largest cruise ship. 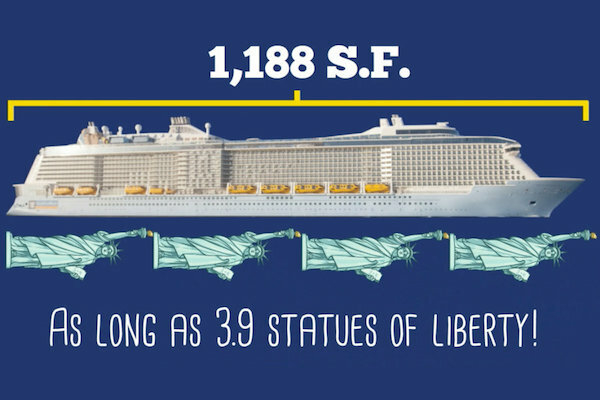 Can you guess how many Statues of Liberty you could lay down next to it? See below for the answer! 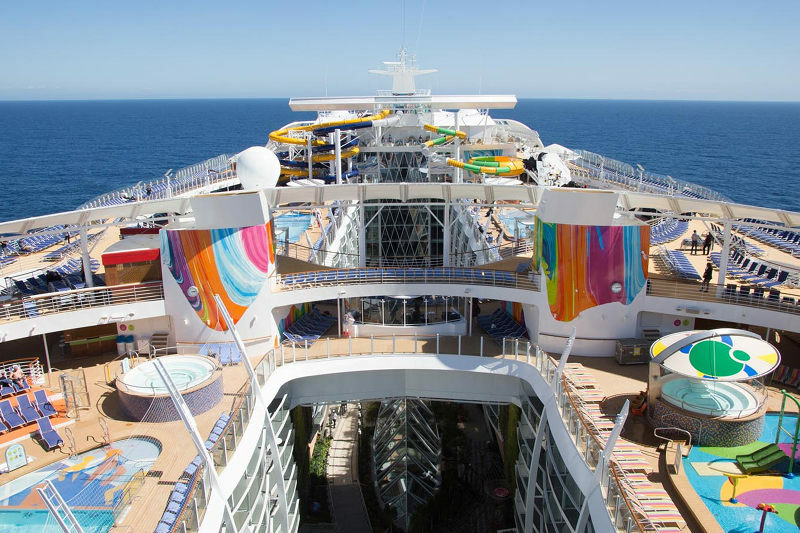 We hope that you enjoyed this and that it helps to find your perfect ship. Which would you sail? Leave it in the comments below! If you liked the post, please use the Share Buttons Below to help to spread the word! Great article – but you wrongly assume a ships GRT is a measurement of weight. GRT is a measurement of internal space, not how much the ship weighs.. Thanks for the clarification, Scott! You’re right and we try not to get too technical in here. Since GRT encompasses length, width & height, we consider it a good measurement to compare across ships. We are a bit lazy in our description of it, so will look into updating that. Thanks again! I would go big once but I prefer the midsize. Less people and easier to get around. 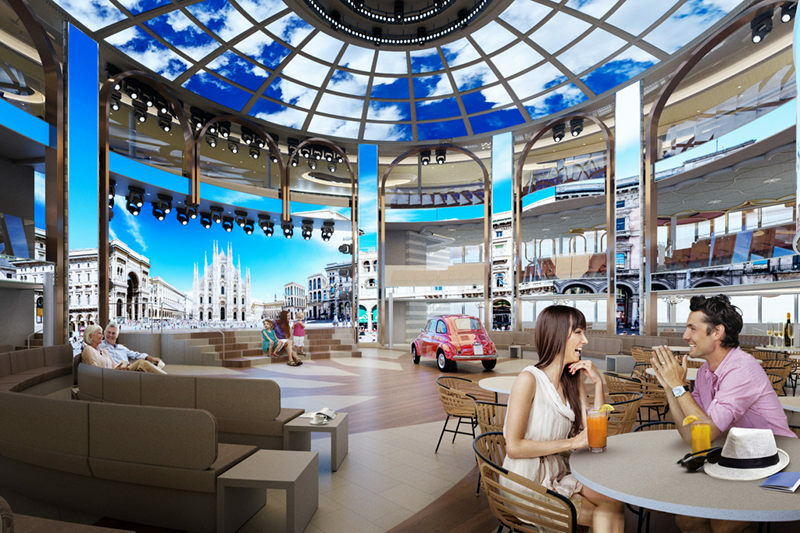 We love cruising and bottom line will be best deal. We would stay on a ship and sail forever. Beats a nursing home. Thanks for the feedback, Stella! 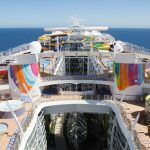 I was told by an cruise ship officer that ships are at about the limit due to the increasing draft (depth). 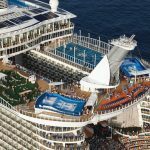 Many are amazingly close to touching bottom when approaching Caribbean destinations and must be slowly and deftly maneuvered into port. Too far from port means using the tenders to ferry people to and from the piers. 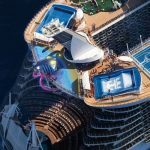 Going longer is an option but as a ship’s engineer once told me, the hull’s design must allow for some degree of flexing and twisting over the crest of a wave or in the trough between to crests, particularly in greater wave heights. Too long leads to increased hull stress which, as seen in several famous oil tanker disasters, failure in the midsection. Wider is also an option but rules out canal crossings, if that would ever be a consideration. All of this makes me wonder just how big these big floating cities will become. I suppose the revenue stream and not the Gulf stream will answer for that.